Temple Lake Villas. Set just off from a large reservoirs at East Pattaya is this grand 2 storey four bedroomed home. Finished with a Thai/Bali theme using expensive hand baked terracotta tiling and thermal block brickwork is sits lovely in the generous garden space with huge private swimming pool and waterfall. Downstairs is an open plan living area with a ground floor master en-suite bedroom to one side, and a dining room and living room to the other. The developer will not fit the kitchen until someone choses to purchase the property and then they will offer a suitable budget so that the new owner can select and design their very own kitchen and work space. Upstairs are a further 3 en-suite bedrooms and the master bedroom has views out to the countryside and the sparkling temples close by. There is a private carport as you enter the property and the garden will be landscaped with tropical trees and plants. There are outdoor terrace areas so that one can enjoy the outdoor living that the Thailand climate allows. This property is set within a small private village environment and once all homes have been completed each co-owner will have input into the decisions of maintenance and security. Temple Lake Villas is a peaceful serene spot, but only a short drive away from Pattaya, with its wide choice of bars, restaurants and shops. 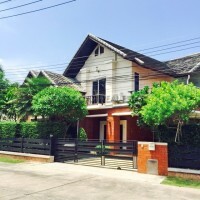 The title deed held under a Thai company name, so no expensive transfer fees.